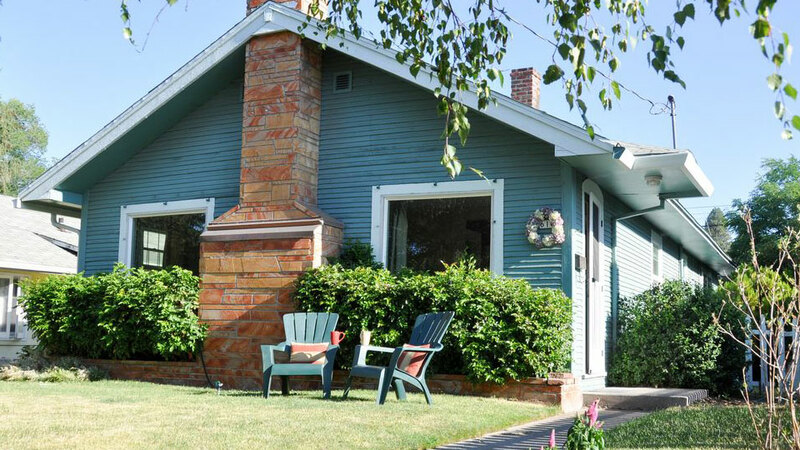 This 1200 square cottage in Bend’s popular Northwest neighborhood is just a few blocks from a gourmet food market, coffee houses, restaurants, and shops. Downtown Bend is a six-minute walk from the house, and a block away from the walking bridge over the Deschutes River to Drake Park. Skiers can make it to Mt. Bachelor in about a half hour. Coming for summer? Inner tubes are available for a summer float down the river. With original hardwood floors, new windows, and bamboo flooring in the kitchen and bonus room, the Bend Bungalow 2 bedrooms and 1 bath, and sleeps 5. The bedrooms have queen beds, the bonus room has a twin day bed with a pull-out twin mattress underneath. The bathroom has a bathtub/shower combination. Lockable storage is available for skis, kayaks, or bikes in the single car garage that is accessible by the alley.